Thanks! I just set up a landing page to subscribe for email updates. I probably should have made that up a long time ago, but I haven't done much to market the game (unless you count this devlog). I've released several demos, but they've all been in-person tests. I don't have a playable build online at the moment - but I will have a few available this fall. I will definitely try to finish and not get carried away with continuously adding content. Wraiths cast magic attacks at fairly close range. The attack is loosely influenced by one of the homing magic attacks from Dark Souls. The blue orbs appear left to right and there's some delay between them seeking out the player. After they travel a short distance, they no longer seek and simply continue their trajectory until off screen. They, along with their magic, can clip through walls – so their difficulty is directly tied to level layout and what other enemies that are present. Hitting them causes them to warp and randomly move away from the player before they fly back in and attack more. I might tweak the distance to trigger the attack, but mostly this has worked out well. This week, I revisited the “big skull” boss fight. I had been postponing animating the additional phases because the initial sprite work took a long time, but fortunately the new frames came together fairly quickly. Instead of making a lot of layers like the initial sprites– I was able to remove chunks of detail simultaneously on all layers and then go back and add the rougher elements underneath. It was also interesting to revisit this fight now that the boomerang and flip attacks have been added. The fight is a lot more manageable now that there is a viable crowd control strategy. Also, the flip allows a 1 hit kill on skeletons, which makes it easier to keep up with the pace of spawns. It's still pretty challenging and probably need some slight tweaks – but in general, I think the experience is much improved. I had a little time this evening, so I revamped a tile set and tried it as a closer background element for cave/tunnel areas. I don't mind floating platform ala Mario Bros. but I think this makes areas like the one below look more natural. Thoughts? Some exiting news! The minotaur boss fight is almost done. The minotaur, also known as “The Duke” in game, is a test of patience and precise attack timing. At times, the fight also requires dodging falling rocks from above. The Duke is slow moving but has high stamina. He can thrust quickly and is dangerous at close range. Getting behind him takes precise timing, but it allows a few extra hits as he turns himself around. The rocks above are placeholders (I reused some comet sprites) but as his health depletes, the Duke will start to stomp violently and shake loose falling rocks from above. He can damage directly while stomping, so it's particularly dangerous if he starts this attack with the player pinned near a wall. Once I have a little more polish, I will have a demo available to try out this fight. I feel like the difficultly is tough but fair and not quite as difficult as the skeleton fight. My day job has kept me busy lately - plus I've been working on a few things on the side. 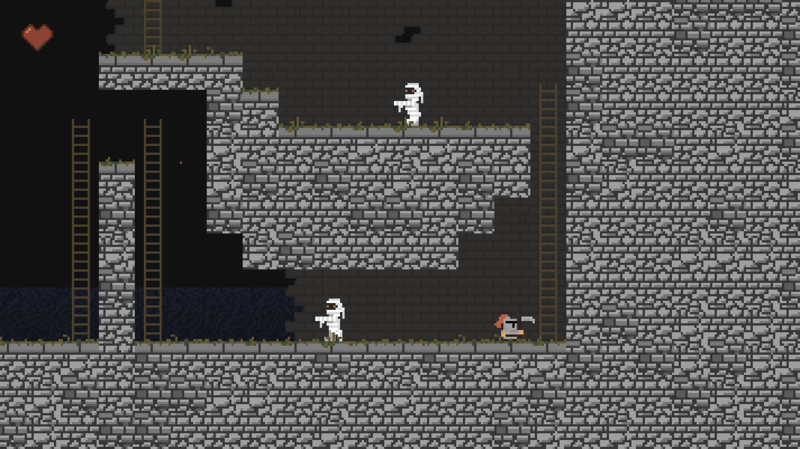 So, not much to show off development-wise at the moment. I decided to make the game a bit more distinct and change the name to The Rise of Lazarus...I'm still deciding whether or not to keep the "the." Any thoughts? There's clearly still a lot of inspiration from the old Zelda games. I'm also working on a website for the game. I don't have much there yet, but RiseofLazarus.com has the logo and a basic landing page for now. An announcement about the new demo is coming soon! Last week, I spent a few hours making this windmill. I started with a repeating brick pattern, and then went through and divided the sections with "wood" lines. I referenced a few photos of windmills from real life and video games as I worked. Once I had finished the structure, I went through each line of bricks and added some details and changes so the patterns had variations with the bricks and mortar. This animation was made in Photoshop, but it should look a touch neater in game. 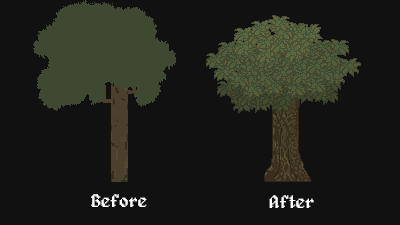 I've also been working on improving my tree sprites. I watched several YouTube tutorials and eventually found one that clicked with my style and usual techniques. Honestly, it might be a touch too detailed for the rest of the game. It also needs a little more variation with the leaves. Something is a little bit off, I think. But overall, I think it's a massive improvement and I'm happy with the result. 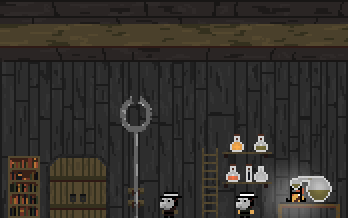 Outside of pixel art, I spent some time playing the early game areas and making small fixes to improve the experience. For example, the player can now "pray" at any altar as a way to regain health without dying and respawning (this will cause slain enemies to return, however). Also, holding down the attack button after death re-spawns Lazarus almost instantly - which should eliminate the frustration of waiting to revive. I've been debating adding a dodge roll mechanic for a while. Truthfully, I expected this game to be done more than a year ago – so the idea of adding new mechanics is a little painful because it extends the finish line of the project. Oddly, it was that very reason that I decided to go ahead with it. Since I've already invested this much time, and I feel like this is an overall improvement – I figure I should take the extra steps to make the end product better. I was able to get this added to the game in just a few hours. The “iframes” use the same counter variable that taking damage does. When the player takes a hit, there is a counter that resets to zero. 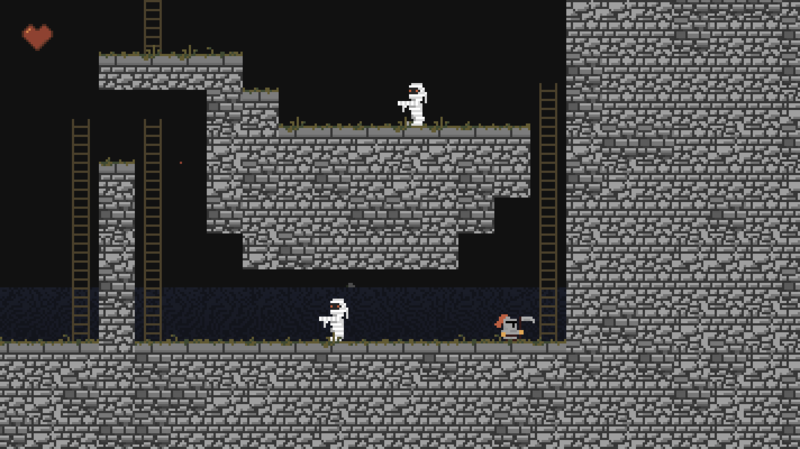 Until it climbs back up to 100, the player is invincible. This provides a small buffer to prevent getting hit twice. For the roll, this counter is set to 95, giving just a small window where the same invincibility applies. Of course, fatal damage (like being crushed) still sends you to the grave. I'm spending time this weekend working on some new art. Here's what I've put together so far. The game is set in a land where a holy war has killed most of the population. Some on the remaining people are now dealing with plague as well.